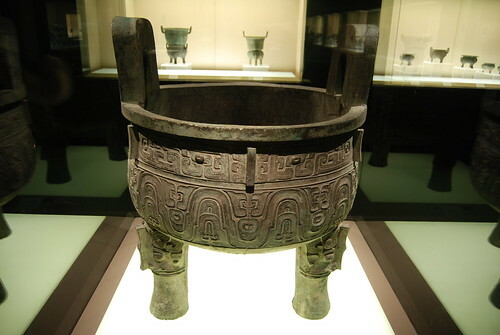 Da Ke Ding Tripod is a famous West Zhou Dynasty bronze ware. Together with Big Meng Ding and Maogong Ding, they are the “Three Bronzeware Treasures Preserved in Greater China”. Da Ke Ding Tripod was unearthed in an underground storage in 1890 with 1200+ other bronze wares, including 7 Small Ke Dings, one set of 6 Ke Bells, etc. Da Ke Ding was first bought by Ke Zhao-Min, then given to Pan Zuyin. After his death, Pan family moved many of their valuable treasures south to their hometown Suzhou. During the turmoil in first half 20th century, the Pan family successfully protected the bronze wares from been robbed by local governors, warlords, and Japanese invaders. In 1951, Ms. Pan Dayu donated these precious relics to newly established Chinese government. This tripod has two big “ear” handle. Its mouth is smaller than its body, which is typical design in bronze wares from Zhou Dynasty. The foot of its legs is slightly wider, which represent a design shift from column legs of Shang Dynasty to hoof legs of Zhou Dynasty. It is decorated with three sets of Taotie Pattern on the body, with a wave pattern through out lower body. The legs are also decorated with Taotie patterns. Da Ke Ding has 28 lines, 290 words inscriptions. According to the inscriptions: A noble named “Ke” cast this tripod in King Xiao Era of West Zhou Dynasty. It records the King’s praise to Ke’s grandfather and assignment of position to Ke. Ke cast this tripod to appreciate the King and as a tribute to his grandfather. The inscriptions on this bronze ware is clear and well presented. Its layout and design represent a new era for bronze ware inscriptions. This is the 11st of 64 culture heritages that the government of China forbids to exhibit abroad. The complete list is here. In Chinese.